Phoenix, 25, the youngest sibling of the prodigiously talented Hollywood clan that includes Joaquin, Rain, Liberty and the late River, is not the most obvious choice for the role of actress-turned-entrepreneur. She was brought up by hippy parents, John Bottom and Arlyn Dunetz, who travelled as missionaries in South America as part of the Children of God sect. They lived a nomadic life before settling in California with their young family, where all their children ended up acting or performing. These days, despite the lapses into Hollywood slang, Summer Phoenix is a typical downtown New Yorker. She lives with her boyfriend of three years, Casey Affleck (brother of Ben), scoots around town on her bike and hangs out with a cool cast of young New Yorkers. After we meet, she leaves to play the piano in her sister's band at a Lower East Side bar. Phoenix is also a strict vegan and blissfully laid-back. She shuns the bland polish of some of her Hollywood contemporaries - this girl even cuts her own hair. Like her siblings, she has steered clear of mainstream Hollywood, opting for challenging roles in indie films - she has been cast as a neo-Nazi in The Believer, a heroin addict in Wasted and an aspiring actress in 19th-century east London in Esther Khan. Despite a hectic acting career, Phoenix seems seriously committed to getting her shop off the ground. Asked how she will cope with juggling everything, she playfully hangs herself with an invisible noose. But, jokes aside, her role in the venture is as thoughtfully considered as her day job. "I agreed to take a break from acting to get the shop off the ground but, obviously, in the future it will be harder for me to be around," she admits. During her five-month screen break, Phoenix has been totally hands-on, sourcing clothes, finding shop fittings and even stripping back the plaster on the walls. And while a fashion boutique might seem a little incongruous with her career to date, the store is a typical Phoenix production. 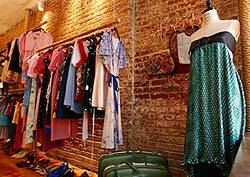 The shop in the slightly grimy Lower East Side sells reworked and customised vintage clothes and is managed by a Californian school friend, Ruby Canner. "We have talked about having a shop since we were nine years old," says Phoenix. "We spent our time shopping for vintage clothes at Salvation Army and charity stores, just as our mothers had. We bought everything there." With her business partner, Odessa Whitmire, Phoenix started planning the store last summer while she was starring opposite Affleck and Matt Damon in This is Our Youth in the West End. Although she only had one day off each week, she squeezed in masses of vintage shopping. "Even though it is exhausting being on stage every day, you spend most of your free time feeling totally wired, so we spent a lot of time wandering around the shops." As well as plundering their own vast fashion archives for the shop, the girls hired a truck and drove from Florida to New York, visiting charity shops in almost every state en route and sometimes shopping from 7am until 3pm each day. "Those shops always open at the weirdest times - God hours," jokes Phoenix. They picked up furniture for the shop on their travels, too. There are antique glass display cases, painted screens and pretty, coral-pink light fittings, as well as dummies and mirrored panels that they found at flea markets. "We would search for months for exactly the right thing. And some things we literally picked up from the sidewalks," says Whitmire. The clothes on sale are typical of the girls' mix-and-match style. A printed jersey Seventies dress is chopped across the top and transformed into a strapless sundress. There are cool sun-tops, bustle skirts and great accessories, as well as a tailor and stylist on hand to rework individual pieces. "I'm used to doing shoots, so I know the tricks of the trade," says Phoenix. All of the Phoenix clan have been involved. Liberty, who lives close to their mother in Florida, has made skirts and dresses, while, on the day we meet, Summer's eldest sister Rain is helping with styling. And, of course, they were all there to celebrate at the shop's launch party last night. Phoenix and Whitmire transformed their back yard, which a few days before looked like a demolition scene from Gangs of New York, into a party space lit with fairy lights and catered for by the girls' local cafe, owned by the musician Moby. Phoenix's next premiere will be for her new film Suzie Gold this autumn. The film, which was shot in London, was her third acting project in England and she describes working with the all-English crew as "a total blast". The comedy features Phoenix as a north London girl trying to define herself outside a traditional Jewish family. Like her first foray into fashion, the film is a breath of fresh air after the darkness of some of her previous roles. "I was getting so bored of being paid to cry," she laughs.